heehee, That gives me the morning giggles. 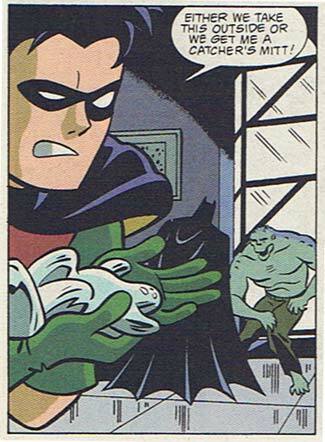 Is that supposed to be killer Croc in the backround? Yes, that’s Killer Croc there. It’s actually kind of an interesting issue, a tv reporter is nice to him on air so he tries to get a date with her. She has a Van Gogh print, so he steals one from the museum to give her as a gift. Batman and Robin have been criticized for causing so much collateral damage during their fights so they’re making an extra effort not to destroy the art in the museum. Kind of looks more like the Hulk than Killer Croc. And speaking of killer croc don’t you think they should put him in a Batman movie? Killer Croc might be good in a movie, although with the “Batman Begins” series’ focus on keeping things real (well, as real as possible given your main character dresses up like a giant bat), I don’t know how well he would play. Might be neat as a freak show kind of guy, though, or victim of some bad pollution or something. Maybe he could be a guy who was born with a deformity like Tim Burton did with the Penguin in Batman Returns. But we will probaly never see Killer Croc in a batman movie or at least not in a live action one. Just found out killer croc WILL be an a movie in the Begins series but it will be animated movie.